Cute as can be! 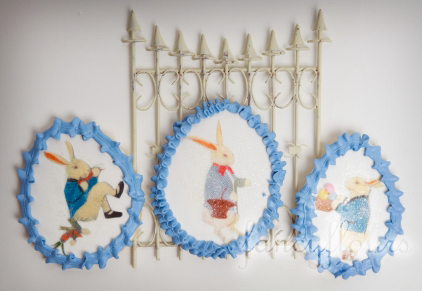 These little rabbit cookies are sure to steal the show! They are first iced with royal icing. Once dry, wafer paper cut-outs are applied with corn syrup. You can then sprinkle with a light dusting of white edible glitter to get a shimmering effect. For the final touch, pipe a border around the edge of the egg. Watch as your friends “ooh” and “ahh” in amazement! Make sure to use the “No Fail Sugar Cookie” recipe located in the recipe section of the BLOG for delightfully yummy cookies that hold their shape every time! Have Fun! This entry was posted in Easter Treats by Fancy Flours. Bookmark the permalink. Please send me link to the “No Fail Sugar Cookie” recipe located in the recipe section – I can’t find it. Thanks.